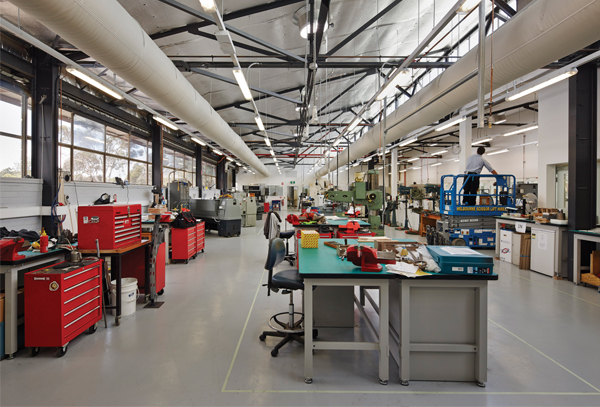 Tucked behind a row of low-slung transportable buildings, on the northern edge of Monash University’s Clayton campus, the Building 40 workshop is not a destination building. Hidden from view, it is separated by a slip road from its more extrovert neighbour – the New Horizons building by Lyons Architecture. In contrast, Building 40 has no iconic pretensions but is no less architecturally ambitious. 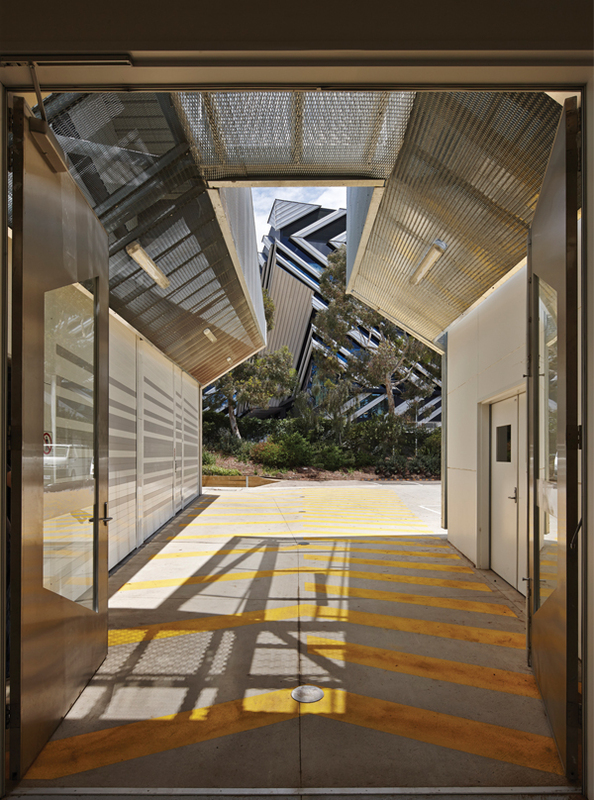 It is a thoughtful, clever project by Paul Morgan Architects (PMA) that seeks to do more with less, drawing on its context and the wider architectural vocabulary of Monash University’s Clayton campus, to tell its story. 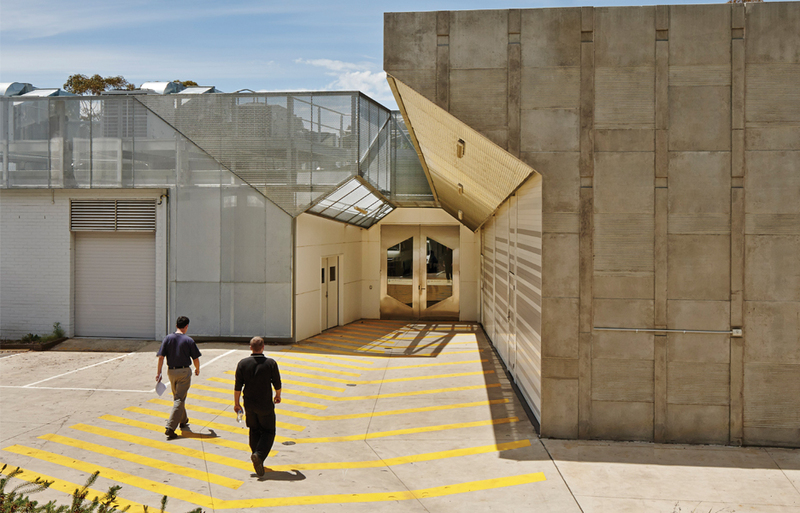 Building 40 is an engineering workshop used by both maintenance services and academic research staff. In an intelligent briefing move it combines the maintenance engineering equipment and the research engineering equipment in one building. 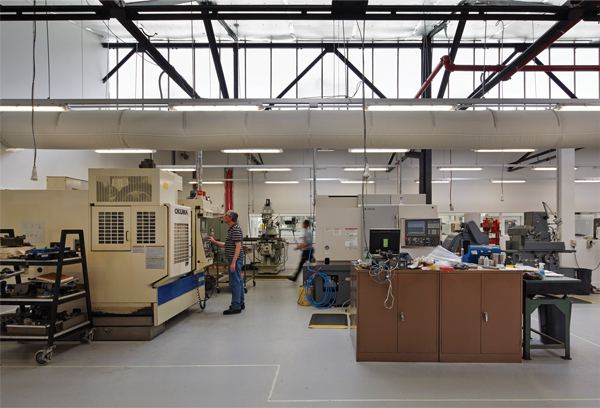 Extracting value for money, the brief caters to the pragmatics of the day-to-day running of the campus while doubling as a utility for academic staff customising, testing and fabricating components required in their research. Building 40 is robust and practical to the point of bluntness, utilising the architectural language of the maintenance facility and a maintenance facility budget. The project is primarily a refurbishment of an existing 1960s sawtooth roofed workshop. The existing building has been updated, with the envelope retained for practicality. The existing built form consists of a strip of horizontal windows on a datum of tan brickwork, clad above in gumleaf green metal sheeting. From the entrance a single axial corridor organises the program. Workshops, storerooms, CAD facilities, a water-jet cutter, off ice space and storage all fall to either side of the primary access. The interior is brightly lit and clearly signposted, exposing the new services and existing metal trusses. The emphasis is on the practical and the functional. The primary design moves are made at the entrance. Unlike the New Horizons building, where a landscaped embankment slowly sweeps upwards, drawing you into the project, Building 40 sits squarely in a truncated car park, whose asphalt surface is as good as it gets in terms of making an entrance. A new extension to the building, located to the right of the entrance, lengthens and defines the entryway. The new addition is small, comprising approximately one sixth of the floor area of the building, housing the cut-off bay – a fabricating area and welding workshop. 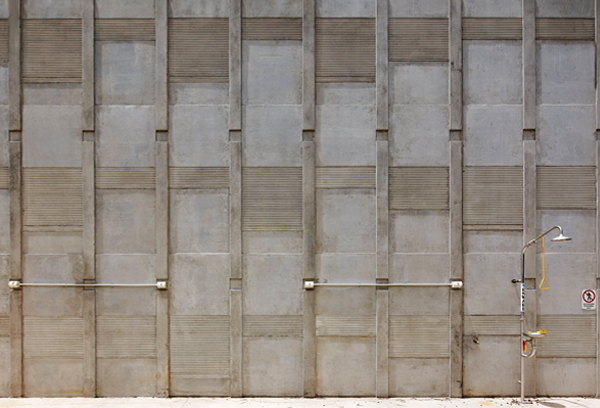 In moving towards the entry the primary new facade – a precast concrete wall – becomes visible, which architect Paul Morgan describes as a ‘version of the Menzies building in relief, scaled down to the intimacy of the site’. 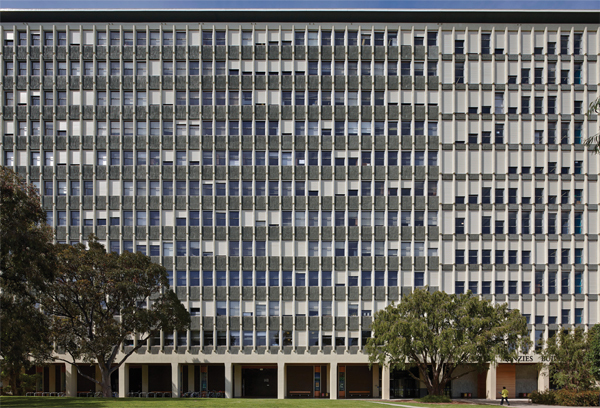 The [Robert] Menzies building was designed for the Clayton campus by Eggleston, MacDonald and Secomb in the early 1960s and is a classic example of monumental functionalist Modernism. Conrad Hamann has described it as ‘an engineering romp, literally, in what was very much an engineers’ university’. The patterning of the new precast wall references the functional monumentality of the Menzies building, highlighting the verticality of the structure and the activation of its facade through the metal roller shutters shading the windows from the northern sun. It is a fitting architectural reference for an engineering workshop. The volumetric definition of the entrance is inspired by the axial, singlepoint perspectival framing of built elements on the campus. The most notable example of this is Leonard French’s enormous circular, concrete-framed, stained-glass window in the Sir Robert Blackwood Concert Hall (1971), designed by Roy Grounds. The entry doors sit front and centre, framed volumetrically through the use of a chamfered perforated metal soff it, which obscures the new mechanical plant on the roof. At ground level, a bright yellow chevron graphic on the concrete surface directs pedestrian traff ic to the entry. Utility on display, the graphic is both a wayfinding device and a cautionary reminder to the pedestrian that they are walking through a loading bay. The pattern on the roller doors, opening to the exterior, highlights the effect of the forced perspective. And, on leaving Building 40 all of these elements act in concert to frame the strong, graphic diagonals of the eastern facade of the adjacent New Horizons building. For a practice with a solid track record of delivering buildings in the tertiary education sector, the Building 40 workshop may seem like a project that would be passed over by an established practice such as Paul Morgan Architects. ‘The University simply wanted a workshop but it seemed to open up possibilities for us,’ reflects Morgan. Building 40 is a building that works hard. Each move is argued from multiple points of view and, as a consequence, the project tells a rich story, not only of its typology but also of the history and the built form of Monash University’s Clayton campus. Sometimes it is buildings like this that show the value of architectural consideration. Projects such as the New Horizons building are expected to meet a level of architectural excellence – they are where one would expect to find architecture. Building 40, however, is a maintenance facility – essentially a university utility. It is blunt and simple yet a building with careful and engaging architectural ideas behind it, extending the building’s narrative and stretching the possibilities of what a service building needs to be. Building 40 provides a locus for design, where one typically imagines only pragmatism. CERTIFICATION: Aaron Mackie, PLP Building Surveyors and Consultants.